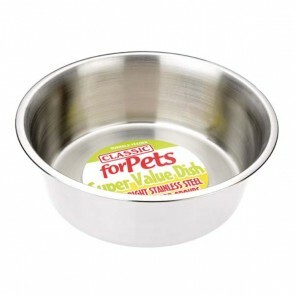 We stock a range of dog bowls suitable for all breeds regardless of size, including traditional stainless steel dog bowls by Good Boy and Classic that are easy to clean, light, hygienic, dishwasher safe, resistant to absorbing food odour, extremely durable and retain their sheen for many years. Also available are stainless steel non tip dog bowls, that have anti slip rubber rings to prevent them from slipping across a floor, including non tip spaniel bowls that use a traditional conical design to prevent the long ears of spaniel breeds from placing their ears into the bowls when eating or drinking, keep their ears dry and clean! We also sell traditional ceramic or pottery dog bowls made by Mason & Cash that are heavier than metal bowls, which are suitable for larger breeds that like to move their dog bowls around the kitchen floor. 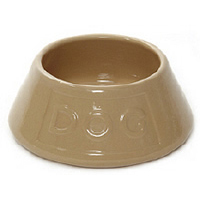 Pottery dog bowls are available in various sizes for food and water are easy to clean, hard-wearing, hygienic and dishwasher safe and resistant to absorbing food odour! Dog Bowls: 5 stars out of 5 based on 1 user reviews. The great thing with Mason & Cash ceramic dogs bowls are there sturdiness, design and build quality. Dog can't push, spin, or spill food and water all over the floor, food always stays in the bowl. The deep water bowls allow dogs to drink more naturally and being ceramic they help keep water much cooler than plastic or stainless steel bowls.